Springtime in Canada, eh? It's not unheard of to have a few snow flurries here in May, I mean it happened just last week (not in Toronto but outside of it. Brrr). Geez, I feel like I'm tempting fate just mentioning that weather fact -- but to make up for this little faux pas, let me tell you about *another* icy blast travelling through our neck of the woods that is a GOOD thing! 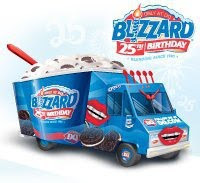 The Dairy Queen Blizzardmobile -- it's HERE! Well, tomorrow it will be here in Toronto at Yonge-Dundas Square at 11am sharp. Bring your appetites and your sunscreen (yep, it's gonna be a scorcher out there) and spend your lunch hour celebrating the 25th anniversary of our best friend, Blizz!